This genus is accepted, and its native range is Himalaya to Tibet. Perennial. 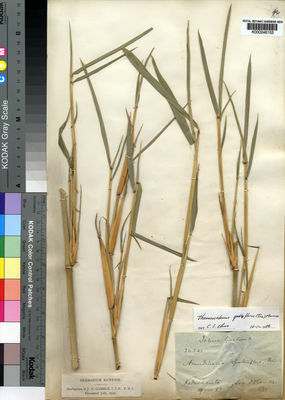 Rhizomes short (3), or elongated (1); pachymorph. Culms erect; 100-400-700 cm long; woody; without nodal roots (1/1). Culm-internodes terete. Culm-nodes swollen (1/1). Lateral branches dendroid. Branch complement one (1), or two (1), or three (1), or several (3), or many (1); in a horizontal line (3/3); with subequal branches (2/2); thinner than stem (2/2). Culm-sheaths persistent (1/3), or deciduous (2/3); without auricles. Culm-sheath blade lanceolate (1/3), or triangular (2/3). Ligule an eciliate membrane (1), or a ciliolate membrane (3). Leaf-blade base with a brief petiole-like connection to sheath. 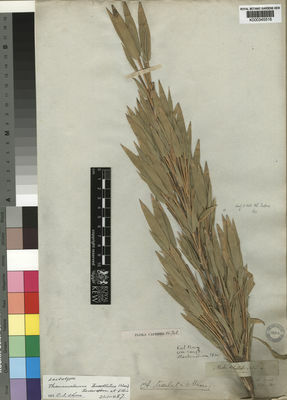 Leaf-blades linear (2), or lanceolate (3); herbaceous (3), or chartaceous (1). Leaf-blade venation with distinct cross veins. Leaf-blade margins cartilaginous (1/1). 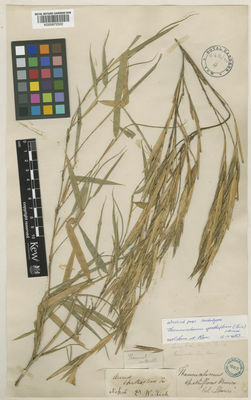 Synflorescence bractiferous (3/3); fasciculate (3/3); with spathaceous subtending bracts (3/3); without axillary buds at base of spikelet (3/3). 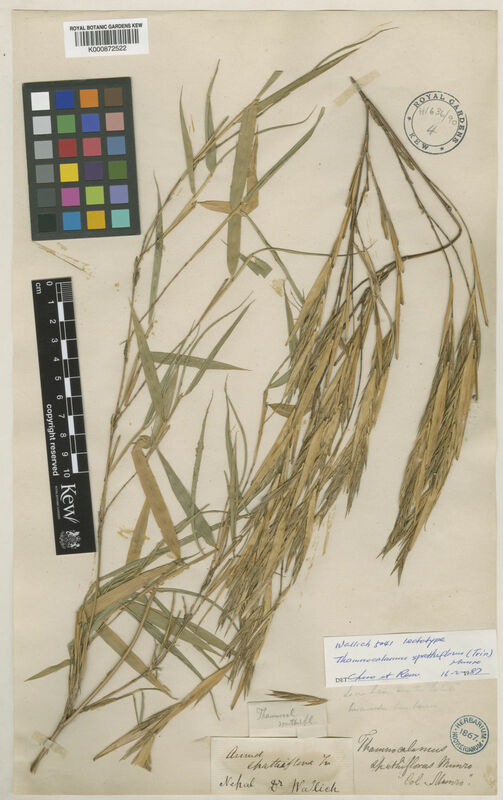 Fertile spikelets sessile (2/3), or pedicelled (1/3). Spikelets comprising 1 fertile florets (1/3), or 3-4 fertile florets (1/3), or 5 fertile florets (2/3), or 6 fertile florets (1/3); with diminished florets at the apex (3/3). Spikelets oblong (2/3), or ovate (1/3); laterally compressed (3/3); 15.4-26.63-40 mm long; breaking up at maturity (3/3); disarticulating below each fertile floret (3/3). Glumes persistent (3/3); shorter than spikelet (3/3). Lower glume lanceolate (3/3); 0.75-0.8833-1 length of upper glume; chartaceous (3/3); without keels (3/3); 5 -veined (1/3), or 9 -veined (2/3). Lower glume apex acute (1/3), or acuminate (2/3). 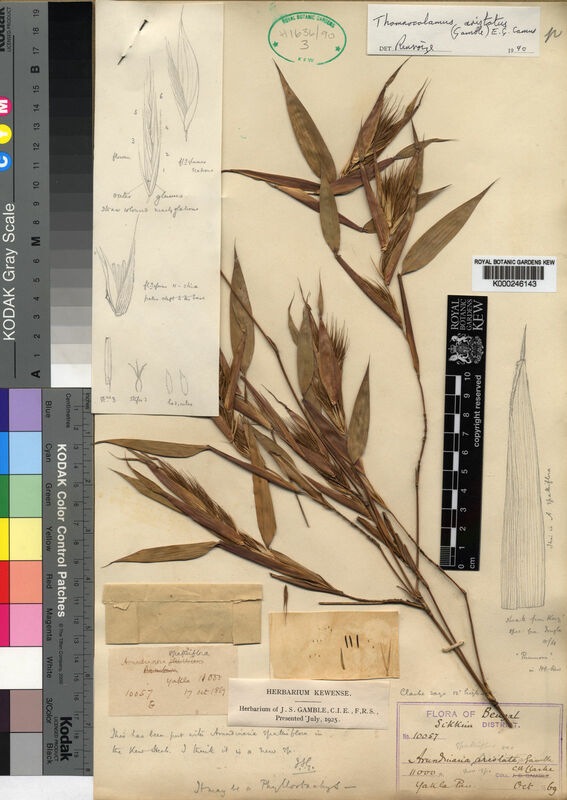 Upper glume lanceolate (3/3); 0.7-1.1-1.6 length of adjacent fertile lemma; chartaceous (3/3); without keels (3/3); 7 -veined (1/3), or 9 -veined (2/3), or 10-13 -veined (1/3). Upper glume lateral veins with cross-veins (1/1). Upper glume apex acute (1/3), or acuminate (2/3). Fertile lemma lanceolate (2/3), or oblong (1/3); chartaceous (3/3); without keel (3/3); 5-11 -veined (1/3), or 13-15 -veined (1/3). Lemma surface smooth (2/3), or asperulous (1/3). Lemma margins eciliate (2/3), or ciliolate (1/3). Lemma apex acute (1/3), or attenuate (2/3); muticous (2/3), or awned (1/3); 1 -awned (1/1). Palea 4 -veined (1/3), or 8 -veined (1/3), or 11 -veined (1/3). Palea keels smooth (2/3), or scabrous (1/3); eciliate (1/3), or ciliolate (2/3). Apical sterile florets resembling fertile though underdeveloped (3/3). Lodicules 3 (3/3); scarious (1/1); glabrous (1/3), or ciliate (2/3). Anthers 3 (2/2). Stigmas 3 (3/3). Caryopsis with adherent pericarp (3/3); linear (1/1), or oblong (1/1). Africa (1), or Temperate Asia (2), or Tropical Asia (2).